The book starts with Bilbo Baggins 111th birthday along with Frodo’s, Bilbo’s nephew, 35th birthday. Every hobbit was invited to the party. Along with the hobbits, Bilbo had invited dwarves and his old friend Gandalf, the wizard. Near the end of the party, Bilbo stands up to make an announcement; he talks about how great it was to know everyone. He then slip on his magic ring and disappears. Everyone went wild when the found out that Bilbo had disappeared.. The next morning, Gandalf explains to Frodo the true meaning of the ring, he tells Frodo of how the ring was made by Sauron the great and how the ring must be destroyed before Sauron rises again.. It was then that Gandalf found out that Sam was listening to everything Gandalf and Frodo had spoken of. Gandalf forces Sam and two other hobbits my the names of Merry and Pippin. On the way to the elf city, where they hope to meet the Elf council, the hobbits team up with a ranger named Strider. The elf council decides that Gandalf, a dwarf, and an elf should accompany the hobbits on their journey to Mordor to destroy the ring. The group continues until they split where Sam and Frodo continue on their own to Mordor to destroy the ring, which is where the first book ends. 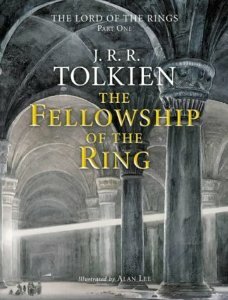 The first Lord of the Rings book is a good book for people who love to read fantasy books. The book is a little boring near the middle, but both the beginning and end of the story makes the reader want to finish the book. The author describes everything in detail which can make the book boring at times. Yet at the same time those details can make some scenes interesting and make the reader want to keep reading. Since the book was written along time ago, the author uses words, which are not often used in modern times. I would not suggest the book to younger kids because the long chapters and descriptions can easily bore them. I would suggest the book to kids who are in eighth grade to adults. I would especially suggest the book to people who are avid readers of fantasy. I would rate this book eight out of ten stars. 1.Why did Frodo leave his house in BagsEnd? 2. Who was to accompany Frodo while he destroyed the one ring? 3. Who created the One Ring? 4. How did Pippin and Merry learn what Frodo was doing? 5. Who saved Pippin, Merry and Sam? 6. Who is the ranger that the hobbits met in Bree? 7. Where were the hobbits and Strider header after they left Bree? 8. Who cured Frodo from his knife wound? 9. Which of the council of nine tried to kill Gandalf? 10. Which two volunteer to take the ring to Mordor? 11. Who were six to accompany Frodo and Sam. 12. What were the eight attacked by? 13. Who fell into the bridge? 14. How did Frodo live after he got shot by the arrow? 15. Who tried to steal the ring from Frodo?